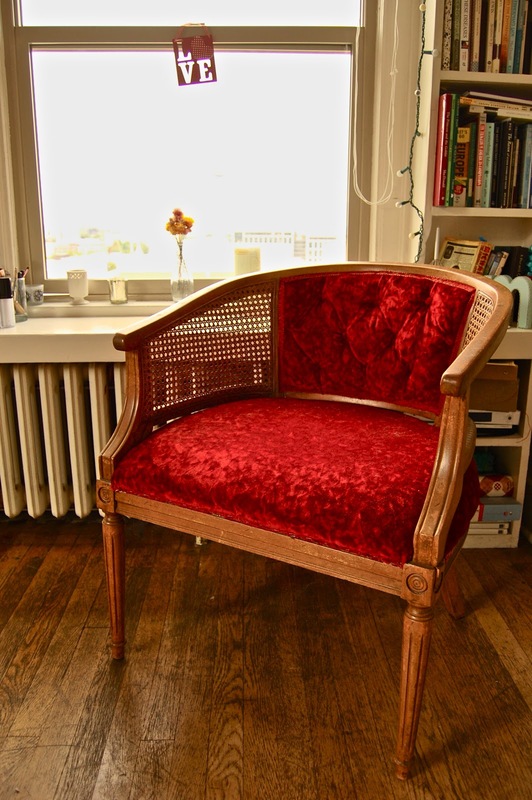 I've lived in my vintage Seattle apartment for almost a year now, and only recently have my roommate and I been able to find comfortable chairs for our living room. We searched for quite a while, however, every chair we liked cost hundreds of dollars. Then all of the sudden within two months we now have three beautiful chairs...the latest of which we found outside our apartment by the dumpster. It was a pretty cute chair, but was clothed in a shiny crimson red velvety fabric that was covered in cat hair and bald spots. It seemed as if it had looked luxurious at one time, but now it just looked shabby. 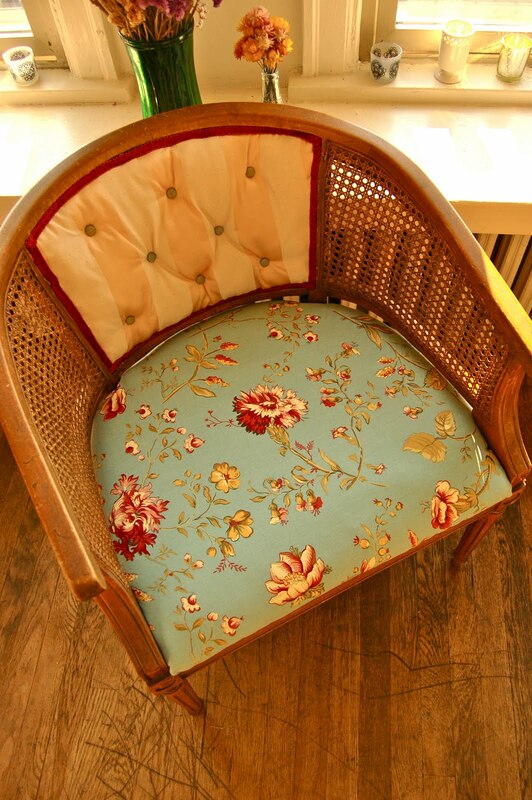 Today I decided to give this chair a cosmetic facelift. Although It is not the perfect fabric, and it is a bit lumpy in places, I can actually sit in it without feeling an allergy attack coming on. It took me almost the whole day to recover, There were many staples and small nails that I had to remove, in the end I used a staple gun to attach the fabric to the back of the chair, for the tufts I re-used the ones that had been left behind in a previous layer of the chair. 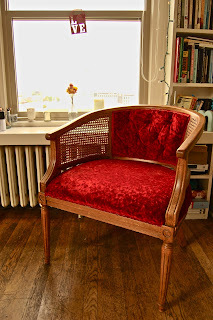 I then trimmed the back cushion with the red trim I pulled from the chair, and on the bottom cushion I opted to use all of the tiny nails to secure the fabric to the chair instead of stapling and covering with trim. All in all I am happy with the result, and it matches the look we have going in our apartment. Great job Tina!! Now we have three chairs!! If you can make something from something that was thrown out and discarded look truely amazing and beautiful, think of what the Lord is in the process of doing with what was already beautiful and amazing, and how much, much, more it will be breathtaking when He is completed with you and your life. You already have touched sooo many lives by who you are.